I recently had some awesome tasting Queso Dip at a party catered by Tijuana Flats. It was so delicious that I wanted to try and recreate something similar at home. It took a few go arounds, but I came up with a good homage to the flavor and consistency of their queso. I absolutely LOVE this cheese dip and will be serving it at my parties. 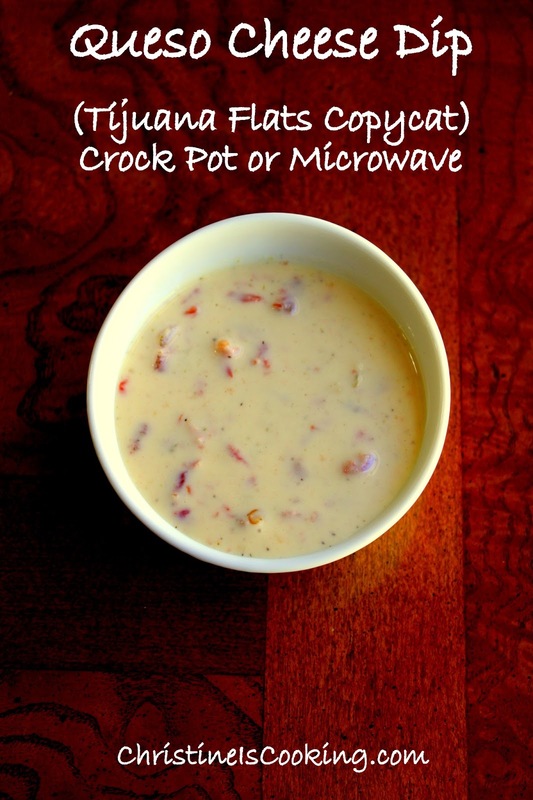 You can make this in your microwave or a small 2 quart crock pot. 1 can of Rotel (well drained) I use the original mild. I press it in the strainer to drain it well. Chop the Velveeta Queso Blanco into 1 inch cubes. Add it and the shredded cheese to your bowl. Add the remaining ingredients and stir. Microwave until hot and melted; stirring occasionally. Chop the Velveeta Queso Blanco into 1 inch cubes. Add it and the shredded cheese to your crock pot. Add the remaining ingredients and stir. Cook on low in the crock pot until melted (stir the ingredients occasionally while cooking. Once melted turn the crock pot to warm or off). Tip: Mild Rotel will add a small amount of heat to this queso. If you prefer no heat at all to your queso, you may try replacing the Rotal with 1 cup of well drained mild salsa. This looks great. Love it. What size crock pot did you use Christine? I am anxious to make this. I used a 2 quart crock pot. Hey Christine, that's sort of what I thought, but I'm such a goof I thought I better check. Love your amazing recipes!! Thank you so much. I'm so glad I came across this recipe! It is fabulou! I made it in the microwave. My new FAVE! Why does the Rotel have to be well drained? This queso is delicious :) I've made it many times for parties and always get compliments! Thanks for the recipe! Thanks for the feedback! That's awesome! How long did you leave it in the Crockpot for?